We offer Cocktail Station to our clients. 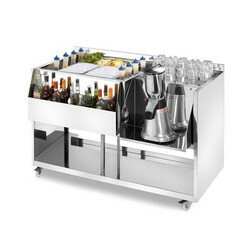 Our firm is a foremost name, involved in providing a diverse range of Cocktail Station. Experts use the advanced techniques to develop this product as per client’s demand. Our product range includes a wide range of Bar counters such as Bar counter, Bar Counter & Cocktail Station, Bar counter with smart bar solutions, Bar Display counter, Glass Storage Rack, Sink Unit and many more items. 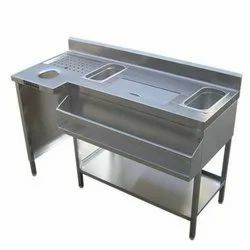 Aarul Fabrication silver Cocktail Station with Speed Rail, Size: 60"x 27"x 34"
Owing to devoted experts, we have been competent to present a wide range of Cocktail Station. These products are made as per industry norms and standards. We feel immense pleasure in offering our clients a wide range of Cocktail Stations.